Time Out Adventures specialises in creating truly memorable experiences with unique activities like Segway’s, Laser Clay Shooting and Walk on Water Balls and much more! Time Out Adventures is the largest Segway tour operator in Australia, running thousands of tours every year in some of the most exciting locations around Australia. Imagine gliding down the Esplanade strip in Surfers Paradise on your Segway with the wind in your hair as you take in the magnificent Main Beach coastline or experiencing a Segway Safari Adventure tour through the Federation Coastal reserve, rated by Lonely Planet as a must do on the Gold Coast. How about a day out in the Yarra Valley, cruising through the vineyards on your Segway, catching some awesome views of the valley and then having a blast with Laser Clay shooting before dropping into the cellar door for some wine tasting. Now that’s a unique day out! But it’s not all about the Segway! Kids, why not try Walking on Water in a water ball or the family can play some Bumper Soccer and then try and win some cash and prizes playing Splash Golf! There is literally something fun for everyone! So don’t delay booking today! Ozbobbles - Walking on Water! You've taken the kids to the pool, the park, the museum, to every aunt and uncle and friend's place, but you've run out of ideas. They're tearing the plaster off the walls and doing the loop between kitchen and lounge room: you need to get them out of the house, ASAP. Ozbobbles are your answer to bored-kid-blues, heck even the adults can do it! It's safe, fun and dry. 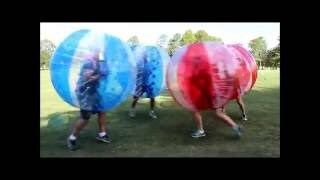 You'll have a ball, rolling, flipping, flopping and summersaulting all the while trying to walk on water! This is one exciting, heart pumping, thrilling activity you must do! Call for session times to ensure they have availability! 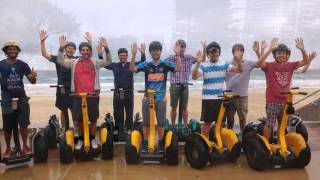 A fabulous 60-minute segway adventure on the Gold Coast. Taking in the hidden gem that is MacIntosh Island, home of Big Foot's cave. Travel along the Esplanade with its magnificent beach views, stopping at Cavill Avenue in the heart of Surfers Paradise . Don't forget to grab a photo under the iconic Surfers Paradise "SIGN". It takes only moments to learn but forever to get the smile off your face! Riding one of these machines is quite simply amazing; it feels like nothing you've experienced - because there's never been anything like it. It is fun and adventure wrapped up in one fantastic experience! This is the very best in interactive activities! Mate versus Mate, Father versus Son! Come on out to the Royal Pines Resort and have some fun with them! Regardless of age or skill, you will train your trigger finger and compete on a level playing field with this fun, safe and unconventional twist on clay pigeon shooting. As you set your sights to the sky a disk is released from the conventional launcher. You then test your speed, concentration and predictive skills by firing a modified shotguns high-tech infra-red laser beam at the target. A module scoreboard generates the shotgun "bang" whenever the trigger is pulled. If your aim is on-target, the sound of a crackling disk is reproduced over the scoreboard which signals your success. On this 60 minute Segway All-Terrain Adventure experience you will zoom around the pathways at the RACV Royal Pines Resort on the Gold Coast and experience the fun of riding a Segway! There is so much to explore around this 200 acre property, such as; travelling through a tunnel under the main road, exploring the bush and zooming around the lake and golf course. On this tour, you will experience the all-terrain Segway at its best! Prior to heading out we provide all operational and saftey instruction needed to make you 'ride ready' before setting out for some fun and adventure. Riding a Segway is quite simply amazing; it feels like nothing you've experienced - because there's never been anything like it. This is fun, excitement and adventure wrapped up in one fantastic experience! This tour just has to be one of those 'things to do on the Gold Coast'. So why not try a little fun and adventure today! Bookings essential! On this 30 minute Segway Resort Adventure, you will zoom around the magnificent grounds of the Royal Pines Resort head into the bush and soak up the ambience of this beautiful resort. You'll experience a variety of different terrains enabling you to experience the Segway at its best. It takes only moments to learn but forever to get the smile off your face! Riding a Segway is quite simply amazing; it feels like nothing you've experienced - because there's never been anything like it. This is fun, excitement and adventure wrapped up in one fantastic experience! Don't delay, book today and have an adventure you'll truly remember! Looking for something new, exciting, different and great fun? 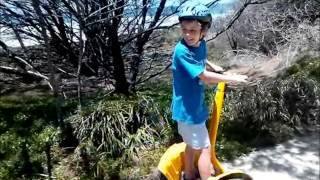 One Segway Resort Adventure - On this 40 minute tour you'll hit the bush, cruise around the lake and put you're all terrain Segway through it's paces in a variety of different terrains. It's fun and adventure wrapped up in one amazing experience. Ages 10 and above. One Laser Clay Shooting - Regardless of age or skill you'll have a blast playing this fun, safe and unconventional twist on clay pigeon shooting. Totally interactive with up to five people at a time being able to play. Suitable for ages 10 and above. 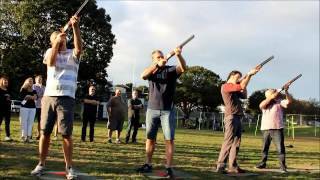 One Archery Session - Be Maid Marion or Robin Hood as you have fun in this medieval sport. Can you hit the target? Come on out to the Royal Pines Resort today and experience something totally new! Segway, Tubing, Air Drop and More! Segway, Tubing, Camel Hump and more! With this fun activity package you’ll zoom around parts of Surfers Paradise on a 30 minute Segway Fun Ride. After learning how to ride one of these amazing machines, you’ll cruise up to the famous Esplanade strip for some all-terrain riding and photo opportunities before heading back to continue your amazing adventure. Next you’ll grab your tube, race to the top of the Tubby Slide where you’ll race family and friends down the slope not once but twice before heading over for some more fun on the camel hump! Then to top off your amazing adventure experience, you’ll scale 12 metres up the platform before jumping on your tube and flying down the airbag ramp, launching through the air and landing on the giant cushion of air. It’s great fun and guaranteed to get the adrenaline pumping! This amazing experience includes; one 30 minute Segway Fun Ride, two Tubing rides, one Camel Hump ride and one Air Bag Ramp ride.